With approximately a third of the No. 6 Boston University men’s hockey team’s season in the books, the race for Hockey East supremacy is heating up. The Terriers (7-4-1, 2-1-1 Hockey East) will resume regular-season play with a home-and-home series versus Providence College, starting with a game at Schneider Arena on Friday. It will be the third conference opponent BU has faced this season. This weekend’s pair of games are crucial for BU head coach David Quinn’s group, who currently sits sixth in the Hockey East standings with only four conference games played. In comparison, Hockey East leader No.3 Boston College has played eight conference games, meaning BU has some work to do in order to catch up. 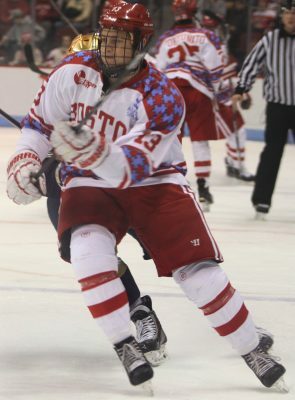 The series against the Friars (5-5-2, 1-3-1 Hockey East) will be the first for BU since knocking out No. 9 Harvard University in a high-scoring battle on Nov. 22. Five different Terriers scored in that one, resulting in a 5-3 victory heading into the break. The Terriers took Wednesday and Thursday off before practicing Friday and Saturday. They then took Sunday off and had a regular week of practice. The mini-break also allowed some guys to get closer to full health. Quinn said he expects junior forward Nikolas Olsson to return to the ice after missing seven games with an upper-body injury. He also noted that freshman forward Clayton Keller is getting closer to returning from a lower-body injury suffered in early November. Looking at Providence, it’s been an up-and-down campaign for Friars head coach Nate Leaman and his squad, as they have yet to put together back-to-back wins. They currently sit dead last in the Hockey East standings after finishing second in the conference last year. Despite the poor record, the Friars are still a dangerous team. Forward Erik Foley and freshman Josh Wilkins headline a balanced offensive attack, which features five Friars with double-digit points. On the defensive end, junior Jake Walman was a Preseason Hockey East All-Team selection, and he’s backed it up with two goals and seven assists through 12 games. Last season, the Terriers and Friars settled for two draws, just half a year after Providence defeated BU in the National Championship at TD Garden. These two teams have had some good battles recently, but Quinn pointed out the differences between this year and years past. To Quinn and the rest of the guys in the locker room, this weekend provides an opportunity for the Terriers to grab some always valuable conference points and start their climb up the standings. Providence may currently be a cellar-dweller, but make no mistake, Quinn is not taking this Friars team lightly, no matter the record.